How much redistribution does Uruguay accomplish through social spending and taxes? 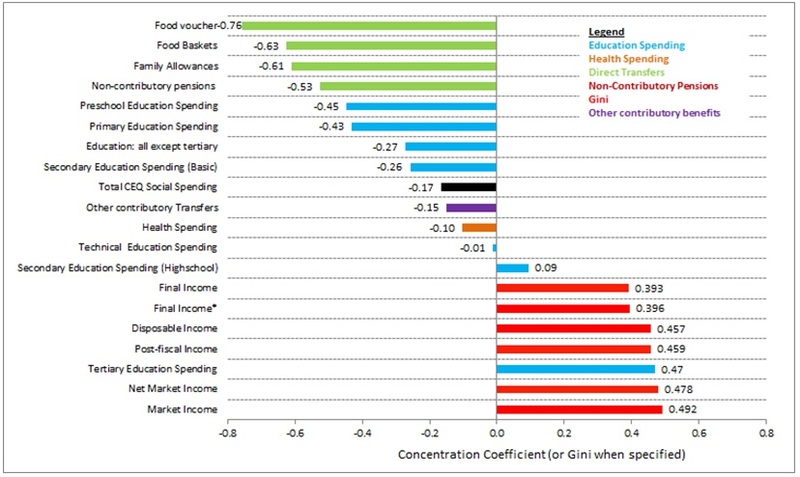 In Social Spending, Taxes and Income Redistribution in Uruguay, we apply standard incidence analysis to estimate the impact of social spending and taxes on inequality and poverty, using the Encuesta Continua de Hogares (2009) and the Encuesta de Gastos e Ingresos de los Hogares (2006). In our incidence analysis, social spending includes direct cash transfers programs, non-contributory pensions, food transfers, and public spending on education and health (also known as in-kind transfers). Contributory pensions are considered part of market income. However, we have carried out a robustness check of our results by including contributory pensions among government transfers and assessing the sensitivity of our results. In Table 1 we present the impact of social spending and taxes on inequality and poverty. We do this by tracing the “evolution” of inequality and poverty from market income (pre-taxes and transfers), to net market income (market minus direct taxes), to disposable income (net market plus cash transfers), to post-fiscal income (disposable minus indirect taxes and plus indirect subsidies), and to final income (post-fiscal income plus in-kind transfers—i.e., public spending on education and health). As can be observed, direct taxes and direct cash transfers are equalizing and poverty-reducing. Indirect taxes offset in part the equalizing and poverty-reducing effect of cash transfers: While the Gini (headcount index) for post-fiscal (after indirect taxes) income is lower than the market income Gini (headcount index), it is higher than the disposable income Gini (headcount index). Public spending on education and health is highly equalizing. Overall, the combined effect of social spending and taxes reduces the Gini coefficient by 10 percentage points. Direct cash transfers reduce the incidence of extreme poverty (measured with the purchasing power parity US$2.50/day poverty line) from 5.1 percent to 1.5 percent, and indirect taxes raise it to 2.3 percent. The combined effect is a reduction of 2.8 percentage points in the incidence of extreme poverty. Table 1. Gini and Headcount Index for Different Income Concepts. In Figure 1, we present the concentration coefficients for all the programs, sorted by progressiveness. The reader should recall that a negative concentration coefficient means that the transfer is progressive in absolute terms. That is, the per capita transfer declines with income. A positive concentration coefficient, but one that is smaller than the market income Gini, means that the transfer is progressive in relative terms. That is, the transfer as a share of market income declines with income. If the concentration coefficient is higher than the market income Gini, the transfer is regressive—that is, unequalizing. The only components of social spending that are not progressive in absolute terms are spending on high school education (which is almost neutral in absolute terms—per capita benefits are the same throughout) and tertiary education. None of the transfers is outwardly regressive, but spending on tertiary education is almost neutral in relative terms. In other words, spending on tertiary education disproportionately benefits the rich (in comparison to their weight in total population). In sum, Uruguay stands out as a country in which the government seems quite committed to reducing inequality and poverty through its fiscal policy (Lustig et al. 2013), except for access to tertiary education from which low-income individuals are blatantly excluded. This exclusion occurs because of a relatively high dropout rate for secondary education. Whether the high dropout exists because students from low-income families cannot keep up with the academic demands or because they need to work, remains to be seen. In addition, although by international standards extreme poverty in Uruguay is very low and direct net transfers significantly contribute to this outcome, extreme poverty has not been eradicated. Except for noncontributory pensions, the size of the average benefit of other direct cash transfers is not significant enough to move all beneficiaries out of extreme poverty. Taxes, and Income Redistribution in Uruguay. CEQ Working Paper No. 10, January. on Inequality and Poverty in Argentina, Bolivia, Brazil, Mexico, Peru and Uruguay: An Overview,” CEQ Working Paper No. 13, April.